75 days. [NC heirloom, seedstock from Benny and Vickie Cox, owners of the famous Collard Shack in Ayden, NC. Introduced 2015 by SESE.] Milder and more tender than most collards, the yellow-tinted leaves form a loose head. Seed for cabbage collards is hard to come by - many thanks to the Coxes for sharing theirs! Pkt (1 g). 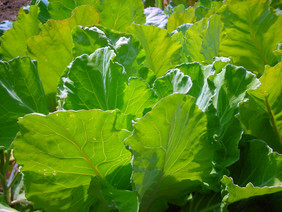 For more on Yellow Cabbage Collards, as well as a recipe, see this NPR story. The Ayden Collard Festival happens every September, here's the link! Packet: 2g unless otherwise stated (approximately 600 seeds) sows 55' direct seeded or 230' as transplants.